Over the last few months, I have mentioned projects, deadlines, articles to write and blog posts for another project in my Tweets. Up until this post, I have been pretty quiet about it here on my own blog. I have been working on a new adventure. To say that this never would have been possible without social media, specifically Twitter, would be an understatement. I am writing the toddler and kiddo articles on the KidsFunPlaza Blog as well as in the magazine. In addition to this, I am doing interviews in the magazine for the Parent and Educator of the month. Our second magazine is going to print next week and I can not wait to see it. The blog is not region specific and has articles that are written by an amazing group of women that I will introduce you to soon in another post. For now, please say hello to those of us on Twitter –> @CutestKidEver, @TheCraningGap, @SandraFoyt and @AlbanyMommy (if I missed someone please let me know). The magazine is a local resource for parents, grandparents, and others that will be available in locations for FREE. Eventually, KidsFunPlaza will be expanding to other regions and will be a fantastic resource for people throughout the country. Do you have a free local parent magazine/paper near you? If you do what do you like/dislike about it? If you do not, what would you like to see in one some day? Also be sure to enter my CardsDirect $50 gift card giveaway. TechyDad is also hosting a LuLu.com Photo Book giveaway. 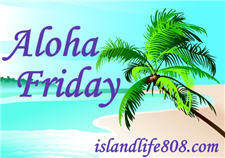 Thanks to Kailani at An Island Life for starting this fun for Friday. Please be sure to head over to her blog to say hello and sign the linky there if you are participating. Oh that sounds like fun… I would love to write for a paper. We do have free papers here and I do read them. There are lots of Local things going on and some articles about local kids. I would love to see more on the Schools children projects, like each year one school has kids write books and then has it published, Now that would be great to feature. We did years ago and they just so happened to screw up my press release for a non-profit event. They did not last long. We don’t have one in our tiny town in the country. twincerely,Olga´s last blog post ..Aloha Friday- FridaY Follow!!!! We do – it is pretty big considering I live in los angeles. I like the advice articles all they preview new businesses an activities for kids which is fun. No, just the school newsletter…kind of sad isn’t it? There are a few – I’ve seen that you can pick up at places – even at the library.